Super Audio Recorder is a powerful real-time sound recorder from any digital resource. Enables you to record sound, played back through your sound card and any other sound sources like microphone , midi, vcr, microphone, Internet audio streaming, Winamp, Windows Media Player, Quick Time, Real Player, Flash, Games, etc. All these work could be done with Audio Mp3 Sound Record software.Super Audio Recorder can start and stop recording at any time. Super Audio Recorder can record any signal played through your sound card into Mp3, or Wav files. Super Audio Recorder can start and stop recording at any time you set. Most functions can be called up with a simple mouse click or menu selection. Super Audio Recorder is able to automatically detect the recording formats your sound card supports and then set the application's parameters for the best possible performance. Record sound from any digital resource. Records audio streaming from any source into wav, avi and other audio files. Qweas is providing links to Super Audio Recorder 8.86 as a courtesy, and makes no representations regarding Super Audio Recorder or any other applications or any information related thereto. 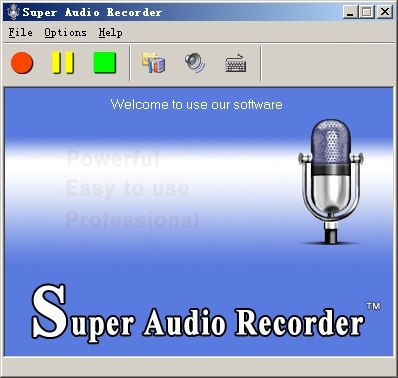 Any questions, complaints or claims regarding this application Super Audio Recorder 8.86 must be directed to the appropriate software vendor. You may click the publisher link of Super Audio Recorder on the top of this page to get more details about the vendor.